Taapsee Pannu - Squash: Actress Taapsee Pannu has an obsession with the game of Squash. She has been playing the game since last few years and is one of her secrets to fitness. 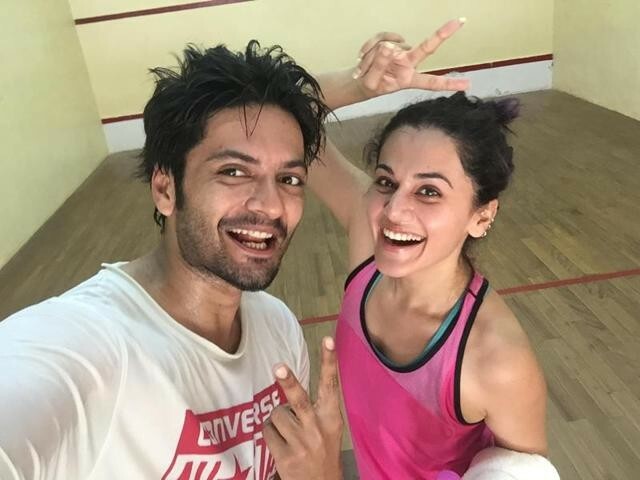 Taapsee is often seen teaming up with her co-actors to play squash on sets of her films for friendly matches. Deepika Padukone - Badminton: The reigning queen of Bollywood Deepika Padukone's fitness secret lies in more than the customary gym exercises. Daughter of ace badminton player Prakash Padukone, Deepika played badminton on a National level. However, not everyone is aware that she was also a state-level baseball player. She aces the game as it's in her blood and is often seen playing badminton when not shooting. Tiger Shroff - Taekwondo: Bollywood’s premium action star Tiger Shroff has been trained in gymnastics and martial arts since childhood. Tiger has been training rigorously and has mastered several martial arts forms. Tiger has learnt Kalaripayattu, modern Kung Fu, Krav Maga and Silat. But it his incredible skills in the competitive sport of Taekwondo which sets him apart. The actor with the most envious body in Bollywood has a 5th Degree Black belt in this martial arts form. Randeep Hooda - Horse Riding and Polo: Randeep is a professional horse rider and has won several accolades in equestrian competitions! A keen polo player, Randeep's interest stems from his love for horses and horse-riding. The actor has his own stable, and even competes in Polo competitions and Dressage. Horse riding is one of the fitness fundas of Randeep beyond the regular gym. Nora Fatehi - Football: Actor-Model-Dancer Nora Fatehi has many feathers added to her hat in keeping herself fit. Nora if not acting she is either seen doing belly dance, or pole dancing or practicing football as a form to keep her fitness adrenaline high. Nora is the only female Bollywood celebrity who has taken the football as a sport seriously and has been taking professional tips from the international football coach Govi Tyler. Football is one of her favourite game and she opted for it as it helps her to stay fit by 360 degrees and keeps her at peace. Amyra Dastur - Badminton: Amyra Dastur, the extremely well known actress down south who has acted with Dhanush, Raj Tarun etc. She is also known for her role in Kung Fu Yoga opposite Jackie Chan and her upcoming role opposite Rishi Kapoor in Rajma Chawal. She is an avid badminton player and has been playing the sport since she was in school. The Isaaq actress continues to play it atleast 3 times a week to keep fit. Ali Fazal - Basketball: The Fukrey actor before making it Bollywood and Hollywood was a state level basketball player. He loved the game so much that he even wanted to have a career in it. But fate brought him to the silver screen for all the right reasons. Ali finds the game to be a stress buster and it takes him back to his good old school days. He is often seen and heard endorsing the game either by playing or sponsoring it.